The 2014 Sochi Olympics torch, the Sukhoi Superjet-100 aircraft, the new Russian spacecraft Rus, as well as dozens of cars that can be seen in practically any street all over the world – all these are the creations of the Russian "designer of the future", Vladimir Pirozhkov. He is now heading an industrial design and innovations center in Moscow and dreams of creating a mass-produced flying car. "The missions of industrial design in Russia and in the West are different,” explains designer Vladimir Pirozhkov. “Russia's task is to reach a competitive level, so that our goods become desirable in any part of the world. In the West, all manufacturers are already very advanced from the technological point of view; their aim is to increase their share in the number of supercool products sold." Pirozhkov knows what he is talking about: At different points in time, the industrial designer has worked on a huge number of products in different parts of the world, as well as being the man responsible for the 2014 Sochi Olympics torch, the Sukhoi Superjet-100 aircraft, and the new Russian spacecraft Rus. Born in 1968 in Chisinau (in the then-Soviet republic of Moldova) into a family of engineers, Pirozhkov studied industrial design in Sverdlovsk (now Yekaterinburg). However, it was to be a chance encounter with the work of a designer from Switzerland that would set the young Russian on the path to prominence. In his fourth year at university, Pirozhkov and his friend saw a newspaper picture of the world famous Swiss bio-designer Luigi Colani with a snow-white Chevrolet Corvette in the background, and got the idea of trying to get an internship with Colani. In the end, they managed to get an invitation from him by post and to get to Switzerland. After the internship, Pirozhkov continued his studies at the Art Center College of Design in Switzerland, and then received a job offer to work as an interior designer at the French automobile manufacturer Citroën. The designer considers the Citroen C3 and C6 to be his best works of that period. The latter model was originally intended for the French president: The team of designers had the challenging task of designing a supercar capable of surpassing the legendary Citroen DS, which had been used by all the country’s previous presidents and which had featured in the cult French film Fantômas. 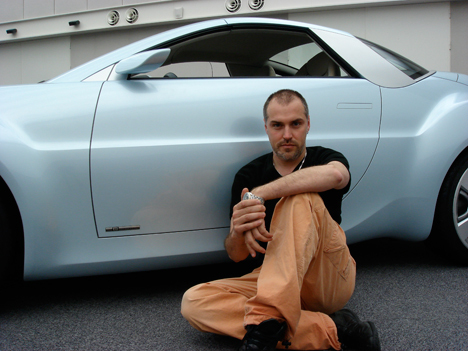 In 2000, having moved to Toyota Europe Design Development in Nice as a senior designer, Pirozhkov was in charge of developing prospective models for 2020-2025 and worked on creating popular models such as the Yaris, Avensis, Corolla, Celica, Prius, RAV4, and the concept cars MTRC and UUV. His personal achievements include the bestselling small family car Auris and iQ, a small "cube on wheels", which despite its small size turned out to be a very safe car. An instrumental role in Pirozhkov's return to Russia in 2007 was played by the then economic development and trade minister of Russia, German Gref, who now heads Russia's biggest retail bank, Sberbank. Gref visited the Toyota center in Nice and invited Pirozhkov to move to Moscow, promising to set up a working environment for him there that was no less advanced. That was how Pirozhkov came to found a multi-sector industrial design and innovations center, AstraRossa Design in Moscow, which he now heads. "When I returned to Russia, I realized that as far as car design was concerned, there was nothing for me to do here, since the main plants have been sold abroad and are now engaged only in complete knock-down assembly of foreign makes,” says Pirozhkov. “My father built the Volzhsky automobile plant, and my grandfather, who too was an engineer, designed sewing frames in Ivanovo, and when the Great Patriotic War [WWII] began, managed to increase their productivity severalfold to make more overcoats and blankets for the front. Now it is my turn to create something," he says. In Russia, Pirozhkov designed the trademark style and colors of the Sukhoi Superjet-100 civil aircraft as well as the interior of the new Rus six-seat spacecraft. He is now building, under the aegis of the Moscow Institute of Steel and Alloys, a complex prototyping laboratory, which will make it possible to create practically any object up to spacecraft and cybernetic organisms. It is proposed that the laboratory will offer training and an internationally recognized diploma to engineering graduates from Russia's best universities and institutes. The laboratory aside, Pirozhkov is working on numerous other projects. For example, an autonomous house, allowing for a comfortable living without any outside infrastructure or communications. Or a personal water purification system for Southeast Asia, in the shape of a small portable pipe. The designer's dream is a mass-produced "transport of the future", individual “aeromobiles”. "An aeromobile could become our national idea, a globally competitive product that could strengthen Russia's positions among world leaders," he says. At his lectures, Pirozhkov often shows his students a photo of the study of Sergei Korolev, the outstanding Soviet designer, considered to be the founding father of the Soviet space program and rocket building. In the picture, there is a simple desk, covered with a plain cloth, with a telephone, and a lamp. "The oligarchs of today are just selling what our grandfathers built, the legacy of the giants," says Pirozhkov. The most important thing, he is convinced, is to make the new generation of Russian designers understand that just to sell and consume is a path to nowhere - what is necessary is to create something new and to move forward.